Oomph in a bottle. 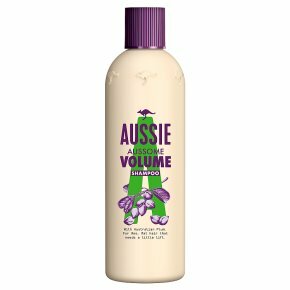 Aussie Shampoo Aussome Volume lightweight formula, with extract of Australian Hops, leaves your fine hair with body and fullness from roots to tips. Australian Hops are a great discovery. It's believed that the proteins they contain coat your hair and help build it up. Our lightweight formula gives fullness from root to tips. So much volume, so much body with our special formula. With Australian Hops extract. For fine, flat hair that needs a little lift.Big up your hair! Our lightweight formula shampoo, with extract of Australian Hops, leaves hair perfectly clean, giving you the kind of body that'll have you bouncing around in front of the mirror (or is that just us?). And in case you're wondering about the beer stuff, it's believed that the proteins in the hops coats hair and help build it up. But don't worry, the only thing that'll make you giddy is the amazing smell! Massage shampoo deeply into wet hair. Rinse out. For optimal big hair results, use with Aussome Volume Conditioner.